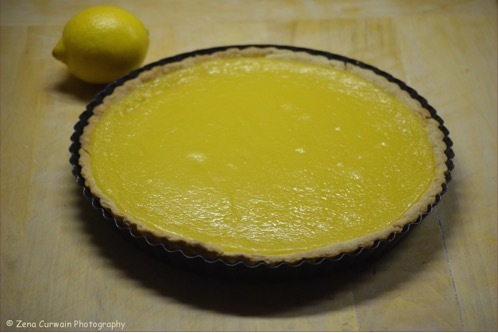 About 30 years ago, I snipped a zesty lemon flan recipe out of a newspaper thinking that it would be a pleasant alternative to lemon meringue pie. Well, fast-forward to 2015 and the clipping has been reduced to a tattered scrap of newsprint. While I’ve been waiting for a loose-bottomed flan ring of approximate size to come into my life, my archives have been crumbling. Where there should be a numeral indicating the quantity of lemons, there is a hole in the paper. Having finally acquired a flan ring at a local yard sale last fall, I recently decided that it was still worth having a go at it. These days, one can cross-reference other sources online, and so began another series of baking adventures. On the advice of local baker, Stephanie Pick, I prepared the lemons the day ahead. She told me that you can intensify the lemon flavour by adding grated zest to the lemon juice and leaving this to infuse overnight. Some people like to strain the liquid before using, but I leave the zest in. 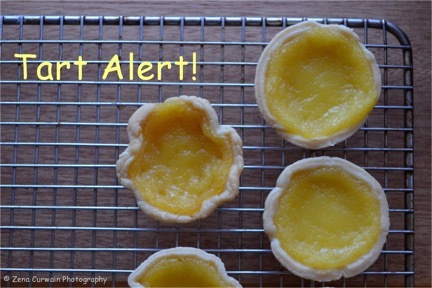 A big thank you to the very generous and talented Stephanie who made the most divine lemon tarts at Queen of Tarts. 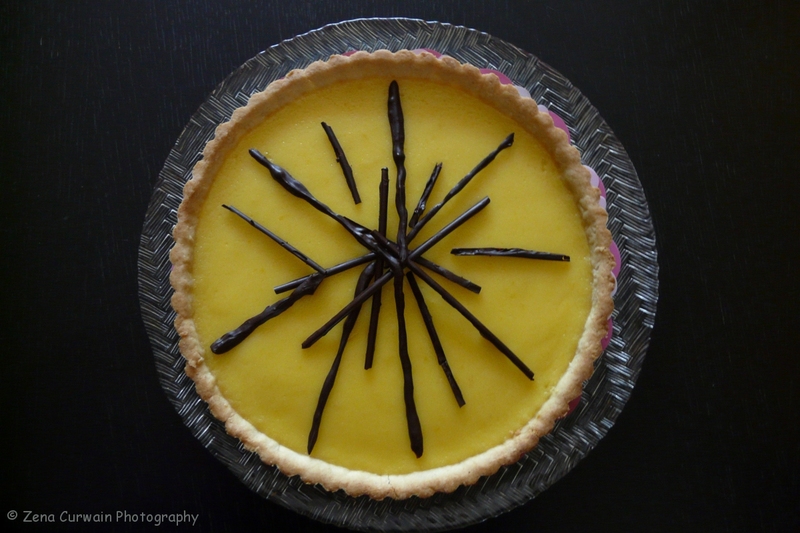 Who doesn’t love a tart tart? We liked the rich flavour and creamy texture of the lemon filling but found the crust a bit dense and hard to get a fork through. Blessed with leftovers, we discovered that the crust did eventually soften up; it was the one time I’ve actually been grateful for a ‘soggy bottom’! The unsatisfactory crust might have had something to do with my handling of the dough. With only one egg for liquid, the crumbs remained just that – crumbs, so I gradually added water until the mixture came together. Perhaps I could have pressed the crumbs into the flan ring, but I didn’t think of that until it was too late. I could also have rolled the pastry a little thinner and used the trimmings to make jam tarts. On the next attempt, I decided to adapt my usual short crust pastry recipe, adding some sugar and replacing the water with an egg. If you have a sweet pastry recipe that you already like, I would suggest using that. Just for fun, I decided to make a gluten-free crust, so that our celiac-suffering friends could also indulge. I typically use a blend of white and brown rice flours, with a lesser amount of tapioca starch. Now that I’ve made individual tarts as well as 10” flans, I can honestly say that I prefer the gluten-free crust. Below are the original recipe I used and my adaptation. Happy Baking! Sift flour and salt into bowl. Cut butter into flour until mixture resembles fine crumbs. Combine egg and sugar. Make a well in centre of flour mixture; add egg mixture. Gradually combine to form smooth dough. Knead lightly a few times. Do not overwork. Wrap in plastic wrap; chill 30 minutes. Roll out dough; line a 9” flan ring. Prick bottom with fork a few times; cover pastry with foil, bringing it up the sides of the ring. Fill to rim with dried beans. Bake 10 min. Remove foil and beans; bake 5 minutes more. Beat butter, sugar and eggs together. Add cream, lemon juice and rind; lightly combine. Pour into partially baked crust; bake 20-25 min or until set. Cool before serving. I needed to add water to the dough to get the crumbs to bind; my one large egg provided insufficient liquid to create a ‘rollable’ mixture. Other recipes call for pressing the dough into the flan ring, which may work equally well for crumbs. I thickened my filling in a bain-marie (allowing the butter to melt into the warm cooked lemon curd, as one would for lemon meringue pie) before pouring it into the partially baked crust, then baking. Having already struggled with the recipe, I had no reason to trust the directions, so I researched other sources, and stuck with the ‘tried and true’ method that I already knew. Sift flour and salt into bowl. Cut butter into flour until mixture resembles fine crumbs. Stir in the sugar. Make a well in the centre of the flour mixture; and add the beaten egg. Gradually combine to form a smooth dough. Knead lightly a few times. Do not overwork. Wrap in plastic wrap; chill 30 minutes. Roll out dough on a lightly floured surface; line a 9” flan ring. There will be excess dough. Prick bottom with fork a few times; cover pastry with foil, bringing it up sides of ring. Fill to rim with dried beans. Bake 10 minutes. Remove foil and beans; bake 5 minutes more. In a medium sized bowl, mix the sugar, eggs, cream, and lemon juice together. Place the bowl over a pan of barely-simmering water and stir until mixture thickens slightly. Add the butter and allow it to melt into the lemon mixture. Stir. Pour the filling into the partially baked crust; bake 15-20 minutes or until set. Cool before serving. This recipe yields one 9” or 10” flan, or, depending on size and depth of pans, 16-24 individual tarts. I will try the tart with almond flour and fake sugar (for a diabetic), looks yummy! I miss the Queen of Tarts, so nice to read of her here! Tart, yes, but sooooooo tasty.